‘The most remarkable winning move on record’ was Reuben Fine’s description of 25...h6 in the ‘Immortal Zugzwang Game’ (page 130 of his 1951 book The World’s Great Chess Games). On page 32 of Fifty Great Games of Modern Chess, Harry Golombek called it the ‘finest possible example of Zugzwang’. Fred Reinfeld considered it Nimzowitsch’s ‘most famous game’ (Great Moments in Chess, page 107). As will be seen below, all that may or may not be true, but initially the game was virtually ignored by the chess world. Concerning the reference above to Chess Techniques, in his Introduction (page ix) A.R.B. Thomas explained why, in many cases, he had reversed the colours. See C.N. 8977. As I have never heard or read the expression “movida límite” I wonder if it is a literal translation from the English, if the translator created it ad hoc or if it was indeed used in Argentina at that time. In any case, the meaning is not clear: limit move?, extreme move? Wood gives as an example of Zugzwang the position in the game Sämisch v Nimzowitsch before the move 25...h6; however, the situation of the pawns on the queen’s side is incorrect. The word ‘accelerate’ is inaccurate since Zugzwang can exist in positions where a player, if he did not have to move, would not lose at all. The diagram of the Nimzowitsch game was also wrong in the original edition of Wood’s book. This is an opportunity for us to mention two monographs. The first, published in Moscow in 1989 is Zugzwang by L. Verkhovsky. We also have an Italian translation (Rome, 1992). Then there is In Search of Zugzwang by R. Brieger and R.W. Twombly (Moon Township, 2001). ‘Jung v Szabados, Hungary, 1952.’ The Italian book gives ‘Szabadosz’, but we note two (Italian) players of the time who were named Szabados: Eugenio and Paolo. About White we know nothing. 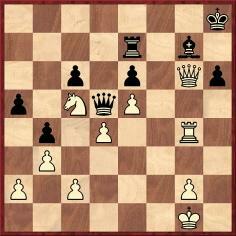 In fact, in the second diagram above if it were White’s move he could still draw with any bishop move that did not put the piece en prise. We shall appreciate information from readers about the complete score, the players, the occasion and the conclusion. This composition by Heinrich Cordes of Berlin won second prize in a Rigaer Tageblatt contest in 1895. White wins as follows: 1 Bc7 Qe1+ (1…Qxf2 2 Kh2) 2 Kh2 Qxf2 3 Bd6 Qf4+ 4 g3+. The study was widely published at the time (e.g. on page 288 of the September 1895 Deutsche Schachzeitung), and the following year (September 1896 issue, pages 257-259) F. Amelung took it as the inspiration for an article dealing with such themes as ‘Tempozugaufgaben’, ‘Tempozwang’ and ‘Reciproker Tempozugzwang’. 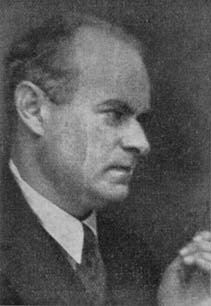 Roland Kensdale (Aberdeen, Scotland) mentions that the Cordes study was featured in a spurious game ending created by J.A. Porterfield Rynd. See the article by John Roycroft on pages 646-648 of the December 2001 BCM and item 151 in Tim Krabbé’s Open Chess Diary on the Internet. C.N. 2927 above discussed whether the ‘Jung v Szabados’ game occurred in Venice or in Hungary. 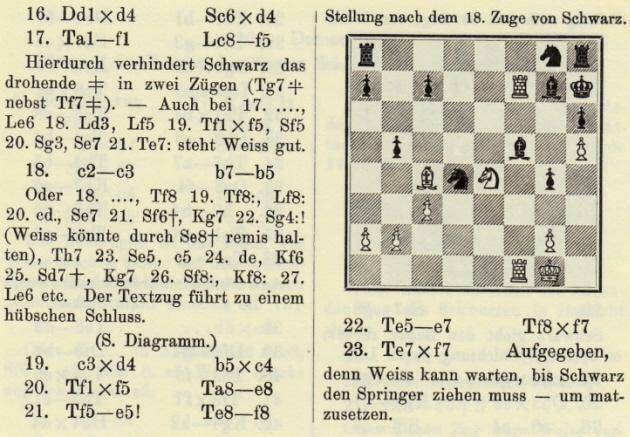 A further complication, pointed out by Richard Forster (Zurich), is that on page 279 of their book Combination in Chess (Budapest, 1965) G. Négyesy and J. Hegyi gave the venue as Dessau (in Germany). An outstanding point about this game (played in Venice in 1952, it is now known, although the full score has yet to be found) is whether Black was Eugenio or Paolo Szabados. Concerning the ‘Jung v Szabados’ position from the 1950s, publications noted have given the venue as Hungary, Venice and Dessau, and now Riccardo Del Dotto (Picciorana-Lucca, Italy) adds that August Livshitz offered a fourth version: Reggio Emilia. See, for instance, the second volume of Test Your Chess IQ (Oxford, 1981, page 32 and Oxford, 1989, page 26). Our correspondent also notes that the Zugzwang position had been the subject of compositions by Rinck and Troitzky, and he believes that the ‘Jung v Szabados’ ascription is false. As shown in the present article, we are aware of no instance of Lasker’s having used that exact phrase. 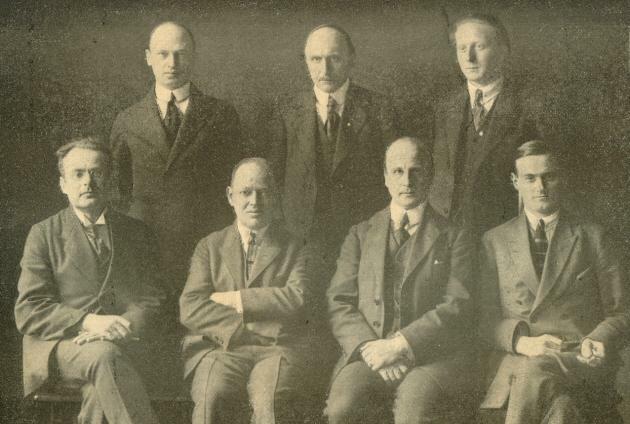 For the further information on Sämisch v Nimzowitsch, see pages 370-372 of Aron Nimzowitsch On the Road to Chess Mastery, 1886-1924 by Per Skjoldager and Jørn Erik Nielsen (Jefferson, 2012). 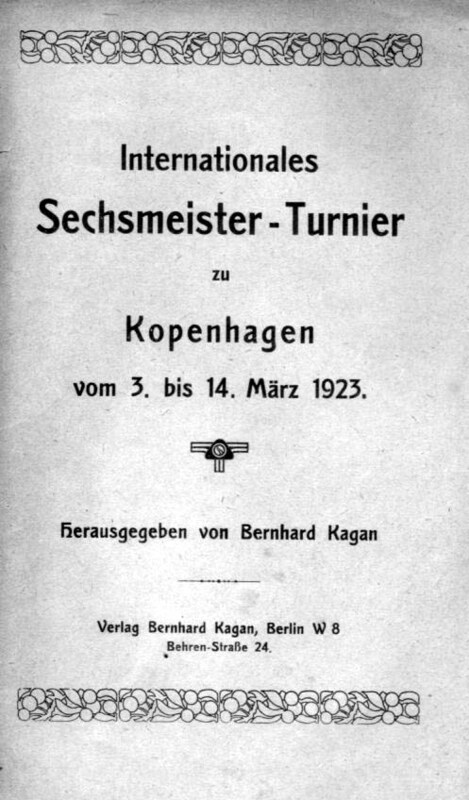 The book gave an English translation of the winner’s notes on pages 213-214 of Kagans Neueste Schachnachrichten, April-June 1927. The Oxford Companion to Chess (Oxford, 1984) describes Zugzwang as ‘a position in which each player would obtain a worse result if it were his turn to move than if it were not’. Later, it is remarked that ‘Zugzwangs occur only in the endgame, most frequently in pawn endings, occasionally in endings with knights, and rarely in endgames with line-pieces’. 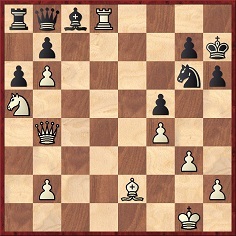 The Sämisch-Nimzowitsch classic (Copenhagen, 1923) is given with this commentary: ‘White is at a loss for a good move in the final position, but it is not a Zugzwang. Black could lose the move in many ways; he can also make threats, and the position is not even a squeeze’. A squeeze (not a term we knew) is defined on page 321 as ‘a position in which one player must give ground only because he is obliged to move, as distinct from a Zugzwang when whoever has the move would be at a disadvantage. 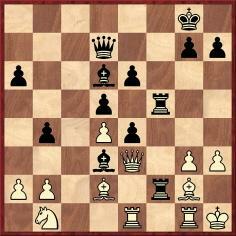 The position White Kd6 and Pc7, Black Kc8 is a Zugzwang: White to play would only draw, Black to play would lose, i.e. having the move would be disadvantageous for both Black and White. On the other hand the position White Kc7, Pb6 and Be2, Black Kc5 and Bc8 would be a squeeze: if Black were to move the pawn could be promoted and if White were to move he could make a waiting move (e.g. Bd3) with the same result; i.e. 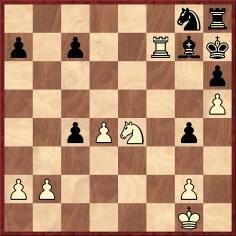 only Black is at a disadvantage because he has to move’. ‘I strongly disagree with Mr Hooper’s understanding of Zugzwang. It means “compulsion to move”, and common usage has given it a sense of negative consequences as a result of that compulsion. Nimzowitsch, in My System, talks about the position of the pieces of the player who must move, saying that Zugzwang is “when any change in their configuration can only be detrimental. In such a position his condition will get worse step by step until he is forced, by the necessity of making a move, to relax his hold on, or weaken, some key point, and his game collapses”. That means that Zugzwang can be a term applied to more than one particular position; it’s a downhill process in which the obligation to move, as compared to being given a right to pass, results in gradual deterioration of one’s game. 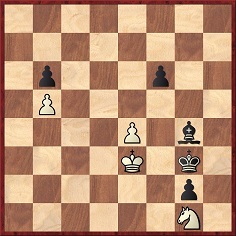 However, pure Zugzwang is the unfortunate obligation to move in the culminating position: the player who must move will lose material or be mated (on the move or by the starting of a combination) by his opponent’s next move, even though the opponent would not be able to do either if it were his move in that position. 1) “Being a pawn up one might regard his position as won anyway.” Might regard? So what? 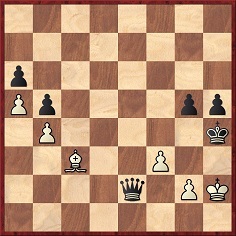 After going two pawns up, it would be clearly won. 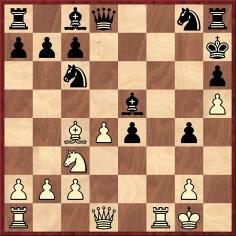 That is the result of the Zugzwang: making Black’s position clearly lost (Nimzo: “his game collapses”). 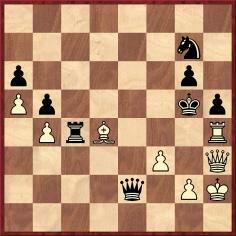 2) If it were White’s move, he could secure a won position by playing Khl (creating the same Zugzwang situation). This doesn’t make the particular position any less a Zugzwang situation. 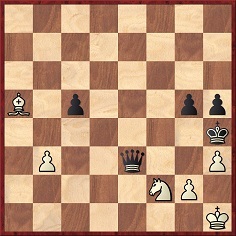 That definition is met by simply this: if it were White’s move, he would win nothing with that move; Black’s move must permit White to win material. (1) The obligation to make a move does not change the result of the game unfavourably. (2) The side that has to move, be it Black or be it White, suffers decisive disadvantage because and only because it is his turn to play. (3) The player to move will on this account alone suffer decisive disadvantage; the opponent to move will suffer no disadvantage thereby. Category (1) positions occur throughout most of the game; having the move is usually desirable. In the Companion category (2) positions are called Zugzwangs, and of these we can say, “whoever plays loses”, or “White plays and draws, Black to play loses”, or, “White plays and loses, Black plays and draws”. Neither player can change the result of the game by making threats. Category (3) positions might well be sub-divided: (3a) those in which there is no other way to win, and (3b) those, such as that given by Mr Myers, in which a win might also be achieved by other means. In the Companion a position of type (3a) is called a squeeze. (3a) is so different from (2) that a separate name seems desirable. For a proper understanding of the endgame it is important to define both these types and to understand the difference between them. The first use of the word Zugzwang, allegedly originated by Max Lange, needs to be determined – a fitting task for readers of Chess Notes, perhaps. Nimzowitsch, writing in the 1920s, is no doubt correctly quoted by Mr Myers. Later, Rinck attempted a more precise definition, but he used the word “blocus”, not Zugzwang. In 1954 Halberstadt labelled category (3a) Zugzwang and category (2) reciprocal Zugzwang. In 1972 I published an article (EG No. 29) using the words squeeze and Zugzwang. EG is the world’s leading periodical on the subject of basic endgame research and studies, and no reader denied the reality of the different categories. The Companion’s choice of terms, an attempt at standardization, may not meet with universal approval; but it is to be hoped that suitable terms will be established in due course. 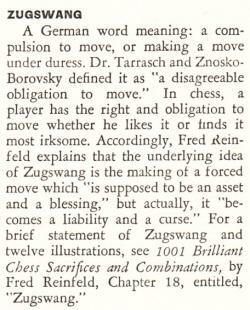 As noted above, in the 1992 edition of The Oxford Companion to Chess the entries on Zugzwang and squeeze were revised. See also the article ‘Drohung und Zugzwang’ by H. Keidanz (Keidanski) on pages 248-264 of the July-August 1911 Wiener Schachzeitung, as well as pages 387-388 of the November-December 1911 issue. 14 Rf7+ Bg7 15 Nxe4 Qxd4+ 16 Qxd4 Nxd4 17 Raf1 Bf5 18 c3 b5 19 cxd4 bxc4 20 R1xf5 Re8 21 Re5 Rf8 22 Ree7 Rxf7 23 Rxf7 Resigns. The book merely stated that ‘Herr Hartewige’ won the game in Chemnitz in 1901. 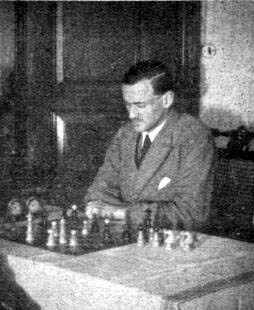 When Hayden originally published the item (Chess Review, March 1953, pages 76-77), the loser was mysteriously named as ‘Herr Neinzwanger’. Can any further details be found? On page 108 of Great Moments in Chess (New York, 1963) Fred Reinfeld described 25...h6 as ‘the most remarkable concluding move ever made in a game of chess’. A book on Zugzwang is You Move ... I Win! by Alex Angos (Davenport, 2005). We have set out some authorities’ disagreement over the precise meaning of the German term in descriptions of chess play, but which games are most likely to be accepted as ‘ideal’ illustrations? 1 Nc3 c5 2 e4 Nc6 3 Nf3 e6 4 d4 cxd4 5 Nxd4 a6 6 a4 Qc7 7 Be2 Nf6 8 O-O Be7 9 Be3 O-O 10 Qd2 d6 11 Nb3 Kh8 12 a5 Nd7 13 Na4 Bd8 14 Nb6 Nxb6 15 axb6 Qb8 16 Rfd1 Be7 17 c4 Nd8 18 c5 dxc5 19 Bxc5 Nc6 20 Bxe7 Nxe7 21 Qb4 Ng6 22 Rd6 h6 23 Rad1 Kh7 24 g3 Ne7 25 Na5 f5 26 Rd8 Rxd8 27 Rxd8 Ng6 28 exf5 exf5 29 f4 Resigns. 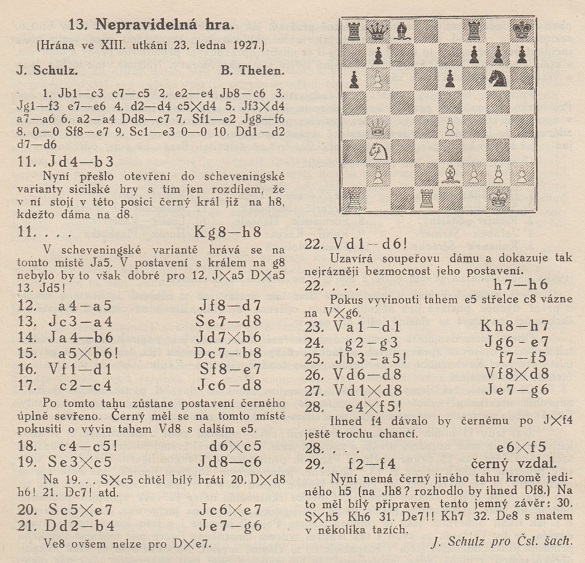 Chernev reproduced his item on pages 192-193 of The Chess Companion (New York, 1968), without correcting his duplication of numbers at move 21. 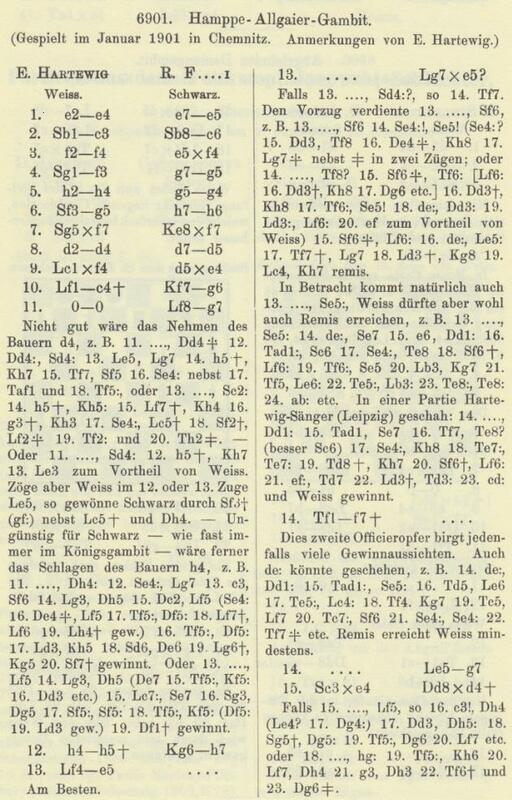 Wolfgang Heidenfeld’s entry on Zugzwang on pages 351-352 of The Encyclopedia of Chess (London, 1977) was absent from the Penguin edition of 1981. The latter book did, however, have an item on Zugzwang by David Hooper in the Endgame section, on page 143. Latest update: 13 March 2019.